Juniper Berry Oil is an essential oil, meaning it contains the essence of the Juniper Berries. Our oil is distilled, undilluted, and contains no synthetics, artificial scents, colors, or preservatives. It is helpful for acne, eczema, and oily complexions, simply place enough oil on a cotton ball to make it wet, and wipe directly on skin condition, using gentle movements. To treat arthritis and rheumatism, take 2-3 drops and massage into affected areas. It can alleviate anxiety, drowsiness, mental exhaustion, and nervous tension, by putting 8-10 drops in bath water, or byputting a few drops in NOW's diffuser. 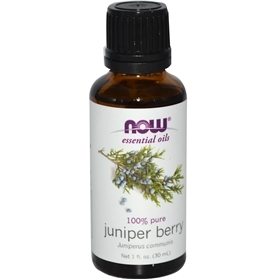 Suggested Use: Juniper Berry Oil (Juniperis communis) is a pleasant fragrance that can be used in aromatherapy. It has historically been used as incense in religious ceremonies and for therapeutic purposesree of: synthetics, artificial scents, colors, preservatives.